Speed to market is everything and BYD is pushing hard - at stake is the first entry advantage. This new announcement is a response to Japanese attack on edge of green mobility revolution and GM Volt charge into the market place in 2011. Will BYD be able to establish Brand in auto sector leapfrogging into electric space in the West? Will access to Lithium and REE supply chain be a crucial point in developing the whole green mobility market space? 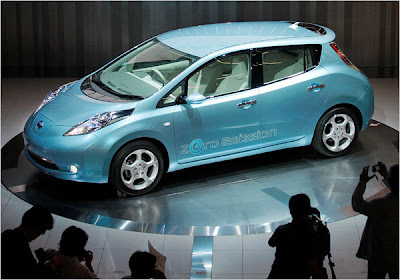 "After Nissan announced that it will use 4 kg of Lithium for every Leaf, market start calculating Supply-Demand picture. All estimation will be proven wrong, if it is the real Next Big Thing. Two - five percent of the fleet is not a revolution in transportation, we are talking about 30% of fleet conversion rate by 2020 to be Green mobility revolution." His comments sent BYD’s shares up 8 per cent to close at HK$48.60, more than six times what MidAmerican paid for its stake nearly a year ago. BYD is a global leader in rechargeable battery technology, but only a recent entrant to the Chinese car industry. Mr Wang, an engineer-turned-entrepeneur, plans to combine batteries with cars to spearhead a green revolution in electric vehicles, with the help of Chinese government subsidies. BYD started selling hybrid electric vehicles to some fleet customers in China late last year but will only start limited private sales next month. 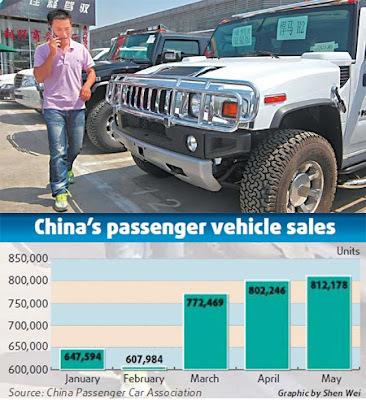 Auto analysts in China have questioned how successful such sales will be. Despite government subsidies of Rmb30,000 to Rmb50,000 for the purchase of alternative fuel vehicles, the BYD hybrid electric car will still cost nearly twice as much as the equivalent BYD conventional model. “From a relative perspective, that’s still very expensive,” said Klaus Paur of TNS, the marketing consultancy, in Shanghai. Most Chinese customers remain dubious about electric vehicle reliability and repair costs, he said. Mr Wang’s announcement that BYD would accelerate plans to sell its e6 all-electric model in the US may be largely “a marketing move aimed at the mainland market”, according to Mr Paur. BYD wants to portray itself as a global player, to boost its image among mainland consumers – and perhaps to help with plans for a mainland stock market listing, possibly within the next year. In terms of conventional car sales, BYD’s growth has been very strong: it sold its first branded car in China only in 2005. On Monday, Mr Wang said he hoped to exceed his 2009 sales target of 400,000 vehicles, as the Chinese auto market continues to steam ahead powered largely by government subsidies for the small cars that BYD sells. With additional reporting by Shirley Chen in Shanghai"
One thing is to find and develop a Copper deposit with NPV over 1 billion with Copper over 2.1 USD/lb and another one is to find a good lawyer, who made his name going against big corporations, and defend your rights in court. 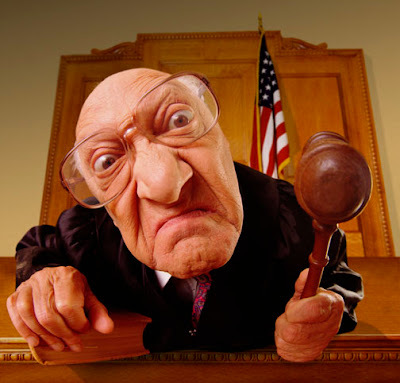 If Junior TNR Gold TNR.v one year ago decided to bully a multi billion market cap Major without any merit and hired one of the top lawyers: it will be a story for a good book - otherwise it is a story for a good legal case. It is interesting enough for our Blog to share with you in our Diary: Junior Mining Education Course. Please, do not forget that we do not give any investment advise here, do not share any tips and analyse here only publicly available information. We have to wait a little bit more on Xstrata back-in into Los Azules story and TNR Gold TNR.V case can hold the keys to majority holding in the project. At stake is 12.5% of total deposit or 25% back-in right to Northern Half of Los Azules. "TNR retains a conditional 25% back-in option on Xstrata's portion of the Los Azules deposit that MAI optioned from Xstrata. TNR commenced action in the Supreme Court of British Columbia on June 30, 2008 and subsequently amended its action on August 8, 2008, against MIM Argentina Exploraciones S.A., a subsidiary of Xstrata PLC. TNR is seeking rectification of the Exploration and Option agreement to accord with the true intentions of the parties and to remove the 36 month time provision on TNRs back-in right. TNR is also seeking confirmation of ownership, without claim from Xstrata, of the strategically located Escorpio IV claim." "Peeyush Varshney, Chairman and CEO of Canada Zinc Metals, commented, "This strategic investment into TNR and its proposed spinoff subsidiary, International Lithium Corp, will give our shareholders diversification into the growing opportunities that rare metal industries are offering. Furthermore, the investment gives us an interest in TNR's stake in the significant Los Azules copper project in Argentina." Thank you for your enquiry to Minera Andes. Under the terms of the agreement, Xstrata would have until August 31 to deliver a decision. However, the agreement also includes an automatic 30-day extension, if Xstrata wishes to exercise the extension. Therefore Xstrata may wish to take additional time in which to consider a decision. If it decides to exercise the extension of time, the decision would be due no later than September 30. Meanwhile copper is charging back close to 3.0 USD/lb and TNR Gold's litigator in case against Xstrata made his place among Leading 500 Lawyers in Canada. "Legal action was started by the Junior against Xstrata, now we have a hint that it was a strategic decision and financing is in place for a legal fight - according to filing TNR Gold is represented by George K. Macintosh, Q.C. from Farris in Vancouver:"George Macintosh leads the litigation group in the law firm of Farris in Vancouver, British Columbia, where he has practised since his call to the Bar of British Columbia. He was appointed Queen’s Counsel in British Columbia in 1987, elected as a Fellow of the American College of Trial Lawyers in 1991 and a Fellow of the International Society of Barristers in 2001. Canadian, U.S. and U.K. publications repeatedly rank him as one of Canada’s leading commercial litigators." Such a gentleman will not play peanuts in something without merit, but we will not speculate here. Is it all too much for one Junior or somebody has carefully calculated the value of the prise?" Electricity is the most convenient form of energy available to us, now we have means to store it. "Applications of this simple statement could transform our way of life dramatically. Once it was estimated that there will be need in maximum six computers in the world. When you have bought CD last time and paid for your mobile phone? Magnitude of this change in energy space will be even more dramatic socially and economically." After Nissan announced that it will use 4 kg of Lithium for every Leaf, market start calculating Supply-Demand picture. All estimation will be proven wrong, if it is the real Next Big Thing. Two - five percent of the fleet is not a revolution in transportation, we are talking about 30% of fleet conversion rate by 2020 to be Green mobility revolution. And players are coming in. Hyundai and other Korean companies' entry means relatively cheap manufacturing base with necessary technological advance along the way: path to more secure with lower cost batteries - it is an important contribution to the development of electric cars mass market. SEOUL (Reuters) - South Korea's Hyundai Mobis Co (012330.KS), the car-parts making unit of Hyundai Motor Group, said on Monday it plans to set up a battery joint venture with LG Chem (051910.KS). Hyundai Mobis has signed a memorandum of understanding with LG Chem, the country's No.1 chemicals company, for a venture which would develop and produce lithium-ion battery packs for hybrid cars, South Korea's top car-parts maker said in a filing with the Korea Exchange. In June, LG Chem said it would invest 1 trillion won in an electric car battery plant over the next four years. It aims to derive total revenue of 2 trillion won from the battery business in 2015. Its U.S. unit is also in a deal to supply next-generation lithium-ion batteries for General Motors' GM.UL Volt plug-in. Hyundai Motor Co (005380.KS) launched its first hybrid car in South Korea in July, starting sales of the Elantra LPI, a hybrid model of its popular compact sedan that uses liquefied petroleum gas (LPG) and lithium-ion polymer batteries. 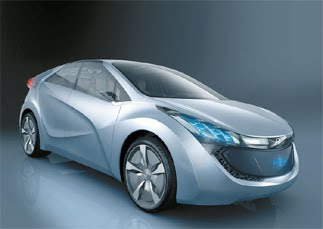 Hyundai is due to launch its first gasoline-electric hybrid, a version of the flagship Sonata in the latter half of 2010. Another South Korean rechargeable battery maker, Samsung SDI Co (006400.KS), has teamed up with Germany's Robert Bosch and operates a car battery venture called SB LiMotive. SB LiMotive is set to build a plant in South Korea to start producing car batteries in 2011. Shares in Hyundai Mobis ended down 9.86 percent at 132,500 won, far underperforming a 1.0 percent fall in the wider market , after it announced on Friday it had bought Hyundai Motor shares worth 1.34 trillion won ($1.08 billion) from Hyundai Steel (004020.KS). LG Chem fell 1.05 percent to 188,500 won." All these babies will need Lithium to keep them running. Auto makers in Japan know how to build cars, how to bring them fast from concept and on the road, how to make them reliable and affordable. All these qualities mean mass market for Electric cars. Below is an article with a good overview of recent developments in a mass market for Electric cars in Japan. It is very important to watch this progress particularly in Japan: country imports all of its oil, gas prices are one of the highest among OECD countries, population is aging and still under severe financial stress after years of recession, people are open to new technology and are an early adopters. Japanese technological and manufacturing base allows to bring electric cars to the mass market. "Mass market means going down unit cost and improved safety and quality of production. Competition is hitting up between BYD and other Chinese newcomers and industry heavy weights like Toyota, Honda and Nissan. Customers will be able to chose, prices will go down and Lithium supply will define the speed of market transformation." Tokyo, Japan — Japan's major carmakers – already leaders in eco-car technology – are ready to begin mass production of electric cars that produce no emissions at all. Can these environmentally friendly vehicles edge out existing gasoline vehicles and hybrid cars in the mainstream market? Electric vehicles have no engine, transmission or fuel tank. They are quiet, with very little vibration as they are run by electric motors instead of gasoline engines. Although EVs have been attracting attention in Japan as the ultimate eco-car because of their zero emissions, there are still challenges to be resolved before they can dream of dominating the global market. Early this month Japan's third-largest carmaker, Nissan, introduced the world's first medium-sized and mass-produced all-electric car, the “Leaf." It will go on sale in late 2010 in Japan, the United States and Europe. 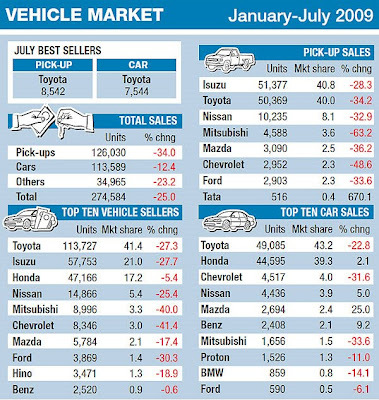 Nissan expects an initial annual production of 50,000 cars, which will rise to 200,000 when the car is sold globally in 2012. 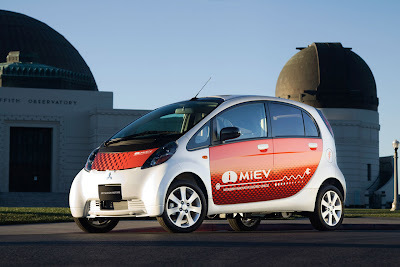 Prior to Nissan's announcement, Mitsubishi’s "i-MiEV" had captured headlines when it went on sale in July to corporate customers. 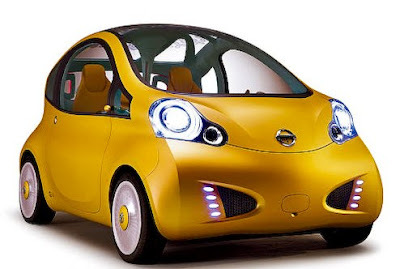 It is the world's first mini-size mass-produced electric vehicle. It is now accepting orders for private customers, to be delivered after April next year. Both EVs run 100 miles on a single battery charge. Another mini-size electric vehicle, the "Subaru Plug-in Stella," introduced in June by Fuji Heavy Industries, runs only 56 miles on a single charge. All three EVs are powered by laminated compact lithium-ion batteries, which can be charged up to 80 percent in 15 to 30 minutes with a quick charger. Charging at home on a regular electric outlet takes from eight to 14 hours. "Short distances like 100 miles and high-cost batteries are weak points of the current electric vehicles. Unless the performance of lithium-ion batteries is drastically improved, EVs will not replace existing gasoline vehicles," said Junji Akimoto, a group leader in manufacturing research at the National Institute of Advanced Industrial Science and Technology. At an exhibition of Nissan’s new cars during the opening of its new global headquarters in Yokohama, Japan, company chief Carlos Ghosn said EVs could account for 10 percent of the new vehicle market by 2020. Akimoto agreed with Ghosn's view. "There is no doubt that lithium-ion batteries are one of the strongest candidates among next-generation rechargeable batteries for electric vehicles, but further technical innovations have to be made," Akimoto said. The high cost of such batteries is certainly a drawback. Both the i-MiEV and Plugin Stella are mini-vehicles, but in Japan they are priced at US$49,000 and $50,000 respectively, similar to luxury cars. Even with government tax incentives to promote the ownership of eco-cars and subsidies for drivers who replace older vehicles with eco-cars, they will cost about US$34,000. More than half is the battery cost. Nissan has not revealed the price tag on its new Leaf. In order to compete with similarly equipped gasoline vehicles, it plans to lease the batteries. According to its public relations department, if the car is driven 620 miles in a month, the cost of leasing the batteries and the electricity to charge them will be one-fifth cheaper than what customers spend on gasoline for regular cars. Although automakers emphasize the 100-mile running capacity, the actual travel distance seems to be around 60 miles if the navigation system and air conditioner are used. However, studies show that most drivers living in big cities and their satellites around the world drive less than 30 miles a day. If the prices fall to a reasonable level, these vehicles could find a place in the market. Currently, only around 100 quick chargers have been installed at gas stations in Japan, but there is a move to strengthen the charging infrastructure among giant supermarkets and convenience store chains. On the other hand, sales of hybrid cars, equipped with both a gasoline engine and an electric motor, are increasing due to government tax incentives and subsidies. When the world's largest automaker and hybrid innovator Toyota introduced its hybrid car, the "Prius" – which can achieve 90 miles per gallon – it got more than 200,000 orders in a month. The Prius is considered the most fuel-efficient vehicle on the market today. Toyota plans to introduce a plug-in hybrid electric vehicle, which can be charged at home, within this year, an electric vehicle in 2012, and a hydrogen-powered fuel cell vehicle by 2015. A pillar of the restructuring program by the struggling Big Three automakers in the United States is to shift from producing existing cars to electric or plug-in hybrid electric vehicles. 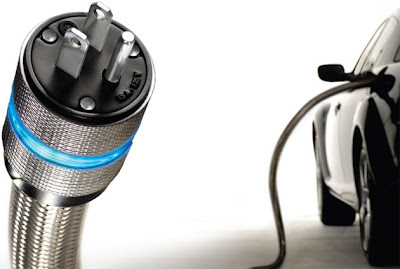 General Motors is scheduled to introduce a plug-in hybrid electric vehicle, the "Chevrolet Volt," in 2010. Ford Motor Co. will introduce four kinds of EVs by 2012. Chrysler has said it aims to sell 500,000 EVs by 2013. It is still far from clear that EVs will ever dominate the mainstream market. Experts still show an interest in fuel cell vehicles, which attracted considerable attention a few years ago before disappearing due to safety issues, costs and problems with peripheral technology. 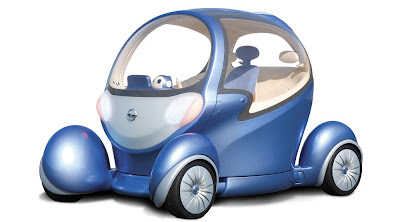 FCVs, which emit only water, are also considered an "ultimate eco-car" by many. While some remain skeptical that these vehicles can surmount their problems, Japan's largest public research institute, the New Energy and Industrial Technology Development Organization, predicts that FCVs will begin selling in 2015, and that an explosion of demand will follow from 2020 to 2030. "Nobody has ever seen electric vehicles that run 300 miles on a single charge, but this distance has already been accomplished by fuel cell vehicles," said Sayaka Shishido, who works in the fuel cell and hydrogen technology development department at NEDO. "The remaining problems are just costs and infrastructure." Shishido predicted that existing gasoline vehicles will be replaced with fuel cell vehicles and that electric vehicles will secure a place as short-range vehicles in the future. Akimoto has a negative perception of FCVs, however. "Fuel cell vehicles need to be developed dramatically. 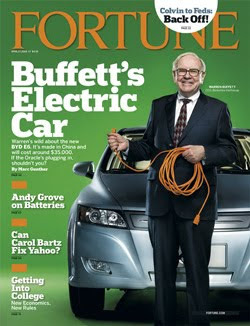 Hybrid cars will dominate the mainstream and electric vehicles will take some share in the coming decade," he said. He predicted that hybrid vehicles will account for half of total car sales in 20 years. Masahiro Tatsumisago, a professor of applied chemistry at the Graduate School of Engineering of Osaka Prefecture University, said, "Hybrid vehicles will be more popular because the current models are very sophisticated." Tatsumisago predicts that gasoline cars will vanish and that FCVs and EVs will dominate the global market in the next three decades." Applications of this simple statement could transform our way of life dramatically. Once it was estimated that there will be need in maximum six computers in the world. When you have bought CD last time and paid for your mobile phone? Magnitude of this change in energy space will be even more dramatic socially and economically. This is an important development and we are talking here with MHI about huge new market applications for lithium batteries. Green mobility revolution can ignite and make possible Green Energy revolution after all. Mention speed and scale of entry by MHI into the new market. All demand estimations for our Next Big Thing - Lithium and REE will be blown away with this transformation of energy generation and storage systems. 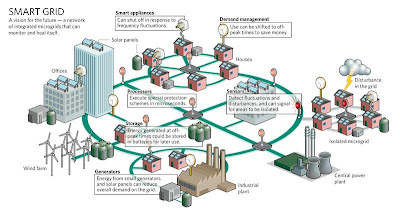 Distributed energy systems and smart grid applications will depend on Lithium based solutions as well. Who will control supply? "To date MHI has supplied the batteries for sample use, but now it has opted to place them on the market. The company looks to promote lithium-ion secondary battery business through a company wide initiative and will begin by incorporating the batteries into its various products, such as forklift trucks and wind turbine power generation systems." "Our Electric Cars will help us to grow solar and wind power to charge them. "A single idle, electric-powered car could generate as much as 10 kilowatts of power, enough to meet the average demand of 10 houses, according to Willett Kempton, director of the Center for Carbon-free Power Integration at the University of Delaware. With vehicle-to-grid technology, controlled by an array of smart meters, car owners plugged in at home or work could allow the grid to draw off unused chunks of power at times when short-term demand is high. Conversely, cars could be recharged when demand is low." Welcome to Energy business: Charge it Low, Sell it High!" Tokyo, August 26, 2009 - Mitsubishi Heavy Industries, Ltd. (MHI) has decided to build a commercial production verification plant in Nagasaki Prefecture and launch its operation by autumn 2010 in a move toward the company's full-scale entry into the lithium-ion secondary battery market. The new plant, to be built within the company's Nagasaki Shipyard & Machinery Works, will have a production capacity of 66 MWh (megawatt hours) of batteries a year, which is equivalent to 400,000 medium-size cells. The batteries were developed in a 20-year-long joint research and development project with Kyushu Electric Power Co., Inc.
To date MHI has supplied the batteries for sample use, but now it has opted to place them on the market. The company looks to promote lithium-ion secondary battery business through a company wide initiative and will begin by incorporating the batteries into its various products, such as forklift trucks and wind turbine power generation systems. In conjunction with this initiative, MHI will launch a new Joint Lithium Battery Operations Department effective October 1st. MHI and Kyushu Electric Power launched joint research and development into large-size batteries for electric power storage in 1988, and successfully developed compact batteries capable of supplying substantial power over long periods. Those batteries are a medium-size cell with energy capacity of 165 Wh (watt-hours), mainly used in vehicles, and a large-size stationary-use battery cell with 350 Wh. The commercial production verification plant, slated for construction start up this fall, will utilize technologies from MHI's diversified business areas, including technologies related to slurry preparation, coating, and mass-production management know how from turbocharger production. The plant will serve to verify and improve factors essential for commercial production, such as verification of operation rates, tact time, battery performance and cost target. MHI's lithium-ion secondary battery business plan calls for the construction of another full-scale commercial plant once all-out entry into the business is decided. The company will make its decision in 2011 taking the market situation, future prospects, and verification results into account. The new Joint Lithium Battery Operations Department will encompass staff members from the Power Systems Headquarters and the General Machinery & Special Vehicle Headquarters and will be charged with integrally advancing product planning and commercialization. Technical Headquarters, the Production System Innovation Planning Department and the Sustainability Energy & Environment Strategic Planning Department will also provide support. Besides producing the new batteries, MHI aims, by leveraging its abundant system development know-how, to enhance their value by incorporating them into the company's final products and systems. Specifically, for vehicle applications MHI will mount the batteries on its newly developing hybrid forklift trucks. The company also plans to provide its lithium-ion secondary batteries to affiliated companies and to supply them to other companies for installation in their products as a power train. For stationary use, MHI will incorporate the batteries as electric power storage units enabling stabilization of electricity supply from renewable energy grid systems, such as wind power and photovoltaic power generation. It also will consider, together with Kyushu Electric Power, applications in the emergency power source systems of the electricity providers, as well as an environmental-friendly independent power source at work site and a power source for micro electricity grids on remote islands. Demand for lithium-ion secondary batteries, which boast superior power storage capability, is expected to increase sharply from 2010 in tandem with further strengthening of environmental regulations. Domestic battery manufacturers will increase their production, expecting demands largely coming from applications in hybrid cars and electric vehicles initially. MHI, as a comprehensive manufacturer of energy-related machinery, looks to further contribute to the establishment of an energy-saving society by focusing on electric power storage, particularly for industrial applications, in addition to further enhancing its existing systems in areas such as high-efficiency power generation and renewable energy utilization." Lukas Lundin's Fortress Minerals FST.v has found more high grade gold in Russia and he has found a small M&A play with Chariot Resources. We were just wondering when he will be back in action. "CHARIOT SHAREHOLDERS: YOUR VOTE WILL DETERMINE THE DIRECTION OF YOUR COMPANY CHARIOT RESOURCES’ BOARD OF DIRECTORS BELIEVES THAT THE ACTION OF THE LUNDIN DIRECTORS IS AN OPPORTUNISTIC ATTEMPT TO SEIZE CONTROL OF YOUR COMPANY THROUGH CONTROL OF THE BOARD WITHOUT PAYING A CONTROL PREMIUM TO YOU FOR YOUR SHARES." We are following Mr Lukas Lundin for a number of years and have never seen him cutting the corners, being its legal or his fiduciary duty to fellow stakeholders. Move is unusual for him and his group and we are monitoring the situation. Our first take is that it is a good reminder of shareholder's right to employ and fire the management. We have a lot of experience, when management forgets who is running the company and who is running the show. "We expect Lukas Lundin to storm the junior space back with his troops. He was out of the picture for a while and put his exploration ambitions on hold consolidating Canadian Gold Hunters CGH.to, Suramina Resources and Sanu Resources. He has grown up fast first in size of the controlled assets and status of Major League by Lundin Mining and then was hit with problems followed - he was busy saving them after the crash. But now we have a few signs of his team coming back into the junior M&A market space and we would like to speculate whether it could lead to any catalyst in juniors we are following." 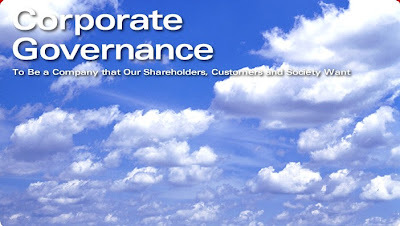 We will call it a corporate governance in action and a good example: who is working for whom - management is working for shareholders and they should run the show. Sleeping at the wheel has never paid back, if you are are not running a major bank or a Wall street firm. TORONTO, ONTARIO--(Marketwire - Aug. 25, 2009) - Lundin Mining Corporation ("Lundin Mining" or the "Company") (TSX:LUN)(OMX:LUMI) today released the following statement to address allegations made by Chariot Resources in an advertisement in a leading daily newspaper:Lundin Mining wishes to make clear that it has taken no part in the dissident proxy solicitation launched by certain concerned shareholders of Chariot Resources Limited. Lundin Mining has no intention of acquiring the Mina Justa Project or in making a bid to acquire Chariot.Commenting on the allegations contained in the advertisement, Mr. Phil Wright, President and CEO said "Lundin Mining is just as concerned as any other shareholder to ensure that we realize the best possible value for our holding in Chariot." We have lost confidence in the ability of present management to accomplish this and accordingly we support the initiative of the Concerned Shareholder Group and strongly believe that a change of management and the board of directors of Chariot is necessary." We are a major shareholder and we intend to support the slate of directors proposed by the Concerned shareholders" Mr. Wright said. About Lundin MiningLundin Mining Corporation ("Lundin", "Lundin Mining" or the "Company") is a diversified base metals mining company with operations in Portugal, Spain, Sweden and Ireland, producing copper, nickel, lead and zinc. In addition, Lundin Mining holds a development project pipeline which includes expansion projects at its Zinkgruvan and Neves-Corvo mines along with its equity stake in the world class Tenke Fungurume copper/cobalt project in the Democratic Republic of Congo. The Company also holds an extensive exploration portfolio and interests in international mining and exploration ventures. On Behalf of the Board,Phil Wright, President and CEO"
But back to Gold - very encouraging results and Kinross Gold knows how to deal in Russia. VANCOUVER, BRITISH COLUMBIA--(Marketwire - Aug. 26, 2009) - Fortress Minerals Corp. ("Fortress") (TSX VENTURE:FST - News) is pleased to announce the latest results from diamond drilling at the Amy, Elena, and Tamara prospects, Svetloye Project Russia. Results include drill hole PDSC-273 from the Elena prospect that intercepted 50.5 metres (from 11.6 to 62.1 metres) grading (uncut) 5.36 grams per tonne (g/t) gold including 26.5 metres (from 32.9 to 59.4 metres) grading (uncut) 9.24 g/t gold and a cut grade of 4.50 g/t gold and 7.59 g/t gold respectively (reducing assays in excess of 30 g/t to 30 g/t). Drill results from the Amy prospect include hole PDSC-264 that intercepted 129.4 metres (from 8.0 to 137.4 metres) grading 1.04 g/t gold, and hole PDSC-262 that intercepted 75.5 metres (from 0.0 to 75.5 metres) grading 1.31 g/t gold. Of additional significance was hole PDSC-263 from the Tamara prospect that intercepted 96.6 metres (from 27.3 to 123.9 metres) grading 0.48 g/t gold. Mr. Lukas Lundin, President and CEO of Fortress Minerals, commented, "We are very pleased to see the continued expansion of the Amy, Elena and Tamara zones. All targets remain open for further growth and we look forward to more drilling success in our ongoing program." Something is baking on. Is it an M&A? "Posted by Peter Grandich at 12:49 PM on Tuesday, August 25th, 2009 Lots of inquiries about action today in Nevsun Resources. As you know this is a prime takeover candidate IMHO. The shares pulled back recently during the consolidation in gold and the umpteen no, new-news story of America’s political view on Eritrea. I had hoped this way overblown concern and gold weakness could bring Christmas early by allowing purchases at $1.40 or under U.S. We almost got our present. Whether today’s latest rumor of takeover amounts to anything or not, I do believe barring a collapse in metal prices and/or a dramatic escalation of the friction involving Eritrea, a takeover of NSU is not if, but when. This is a superb project with a fantastic payback schedule. If and when such a deal takes place, I suspect Eritrea can become a major area play given the tremendous exploration potential it has. 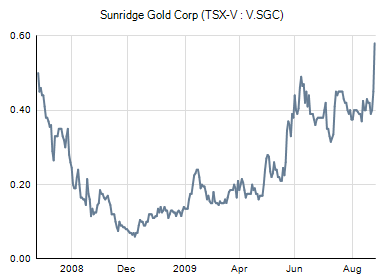 Sunridge Gold (SGC-TSX.V $.40) is a natural “next-in-line” play with a strong package of projects. My belief, albeit prejudice due to the working relationship I have with SGC, is SGC becomes the next institutional/mining company darling in the area. "Second stage is when idea has received industry recognition. Industry insiders, their brokers, funds and managers are busy taking stakes before telling to their clients to Buy." Our Next Big Thing is getting serious push these days with industry magazines. "It looks like we do not have to preach about our Lithium and REE bull market any more and CNBC and BNN is taking the lead with THE Wall Street Journal. As we all know Electricity comes from the electric socket on the wall, but where from Lithium and REE comes apart from broadcasting fever and websites full of this stuff?" A Buck or Two, Tjalling (TJ) de Jong also reports on the different lithium plays. "Until now almost everything with Lithium on the web page was making you money and it will continue for a while, but it is time to make your homework right: we will have a roller coaster ride and you need to know what to hold, what to add on the dips and what do not even touch. If you never even called the company you are investing in, do not bother with the whole exercise - you will be burned. Hungry brokers and investors after market collapse will rush into hot very narrow money base Lithium and REE sector with micro caps and the ride could be explosive." 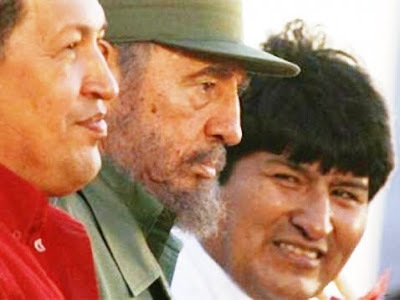 Regarding Bolivia we have put our thoughts before. 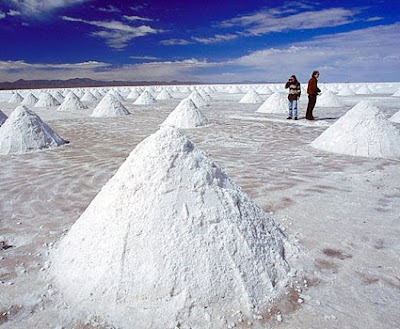 "There are a lot of debates that Bolivia is holding the keys to Electric cars and Green mobility revolution by its status of "Saudi Arabia" of Lithium. Please invest some time and watch both videos:..."
West will have to develop its own supply of Lithium and REE and it is already happening. Dan Gleeson writes in International Mining's September Leader on the growing importance of and interest in lithium, and, by association, Bolivia. In his latest newsletter, A Buck or Two, Tjalling (TJ) de Jong also reports on the different lithium plays. TJ writes, "A small number of countries produce lithium from either brines or concentrates, Chile being the largest producer. Argentina, Chile and Australia together accounted for about 82% of the total lithium production in 2008. Supply of lithium is dominated by production of lithium from brines SQM FMC lithium and Chemetall and the sole mineral producer Talison Minerals of Australia. 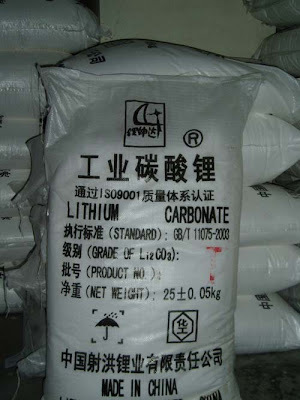 China has been ramping up production since 2000 but as of 2008 supplies 8% to the lithium market." In just the past week alone we have heard from five lithium explorers. The main uses for lithium have been batteries, ceramics and lubricating greases. Demand is expected to grow significantly as auto makers begin to produce hybrid electric vehicles (HEV) and electric vehicles (EV). TJ says "Lithium Ion Batteries are the preferred method for electrifying these vehicles. World production has come from 13,000 t to about 22,800 t lithium in 2008." Japan, Korea and China already have national Lithium Ion Battery technology development programs. When David Pescod of Canaccord Capital touched base with TJ, and asked for some stock picks, he said he prefers the plays that are based on brine because of their huge cost advantage. Galaxy Resources has signed agreements for financing of its lithium project with China's Creat Group, raising at least A$26 million for the company. In addition, Creat will provide Galaxy with 100% debt finance of around A$130 million for the purpose of developing both the Mt Cattlin spodumene (lithium/tantalum) and Jiangsu lithium carbonate projects. Managing Director, Iggy Tan said "this deal provides us with a bedrock Chinese shareholder and enables us to move ahead with the development of both the Mt Cattlin spodumene and Jiangsu lithium carbonate projects." Galaxy has completed a definitive feasibility study that suggests Mt Cattlin (Ravensthorpe, Western Australia) is commercially viable based on a processing rate of 1 Mt/y over a 15 year mine life. The company is planning to commence the development of the mine and the construction of the mineral processing plant in Q3, 2009 with first concentrate production scheduled for Q3, 2010. The company has also commenced a prefeasibility study into the value adding downstream production of lithium carbonate (Li2CO3). Galaxy plans to establish a 17,000 t/y lithium carbonate plant in China due to lower associated capital and operating costs, as well as being close to the strategic growing battery markets in Asia. Linear Metals is reactivating exploration on its road accessible, 100% owned, Seymour Lake lithium/tantalum/beryllium property located to the north of Lake Nipigon, near Armstrong, in north-western Ontario, Canada. 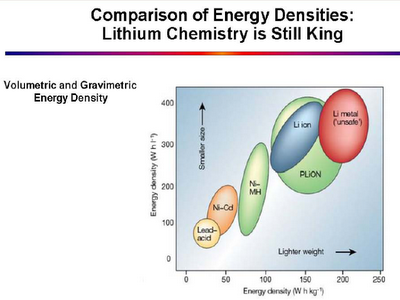 Linear says "the project is being reactivated in response to rising prices for elements such as lithium and tantalum. Brian MacEachen, President & CEO: "Historic exploration on the large Seymour Lake property has returned some very exciting lithium grades. Incredibly, lithium has never been the primary focus or target of an exploration program and as such the true potential has yet to be tested. We are taking immediate steps to initiate a drill program that will specifically target lithium mineralisation at Seymour Lake." Lithium One has announced the first results from its Phase 2 diamond drill program at the James Bay lithium project in Quebec, Canada. Consolidated Abaddon is in the process of staking high potential lithium prospects in North America. 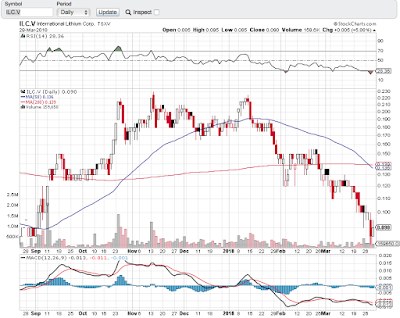 It is also "evaluating existing lithium prospects for possible joint venture or acquisition." Ashburton Resources has signed an agreement to acquire a 100% interest in 37 mineral claims with known occurrences of lithium bearing springs and clays in Churchill and Pershing Counties, Nevada, USA. The claim block has historically showed total lithium contents ranging from 86 to 1,480 ppm from rock and soil samples in auger holes. Ashburton says "Chemetall-Foote Corp.'s Silver Peak operation, located in Clayton Valley [320 km] south of the property, is the only lithium brine producer in North America and has been in production since 1966." Also in Nevada is Canada's Western Lithium where its flagship Kings Valley property has a NI 43-101 resource estimate for the initial stage of development and in total hosts a historically estimated 11 million tonnes of lithium carbonate equivalent (LCE). Stage 1 of what could be a huge project boasts an indicated resource of 48.1 million tonnes grading 0.27% lithium with a lithium carbonate equivalent (LCE) - 688,000 tonnes and 42.3 million tonnes grading 0.27% lithium (LCE - 606,000 tonnes) inferred. A scoping study is planned for completion during the current quarter and if all goes well the company is aiming for first production in 2013. John Chadwick is editor/proprietor of International Mining magazine - http://www.im-mining.com/"
"Who will hold the keys to Green Mobility? Will western society with its almost forgotten memories about Freedom be able to protect one of its basic rights to move on a highway or all taxpayers bailout money will be spend on bonuses spiced by Front Running and Tipping along the way? These are the real questions. Who will finance our Junior Lithium and REE Bull to deliver Energy Security?" We will have to now. There are resources and there are people who are working on Energy security of the future - secured supply of Lithium and REE. Recent boom in Junior market related stocks confirms our observations. 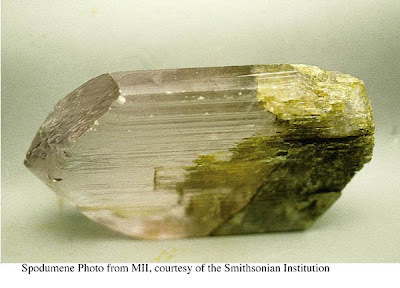 "With Lithium and REE previous work was funded directly or via Majors by governments in the rush of a cold war and then properties were mostly abandoned once military needs were satisfied. Extensive data and even core from previous drilling programmes could be available on sites and it is as valuable in exploration as properties itself. REE market in the West was killed by China's pricing of hard rock mining and they have consolidated market after that. Now with Electric Cars and Green Mobility Revolution at our doorsteps Lithium and REE is a strategic commodity, when every government would like to have a certainty of supply and not to trade Oil dependence for Battery dependence. 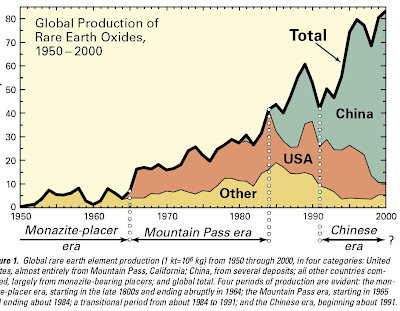 It is an opportunity to restart heavily indebted western economies and move it in the new high value added 21st century manufacturing space"
China mines over 95pc of the world?s rare earth minerals and is looking to hoard its resources. The Japanese government has drawn up a “Strategy for Ensuring Stable Supplies of Rare Metals”. It calls for `stockpiling’ and plans for “securing overseas resources’. The West has yet to stir." Who will hold the keys to Green Mobility? Will western society with its almost forgotten memories about Freedom be able to protect one of its basic rights to move on a highway or all taxpayers bailout money will be spend on bonuses spiced by Front Running and Tipping along the way? These are the real questions. Who will finance our Junior Lithium and REE Bull to deliver Energy Security? 1. Lithium is Not only in Bolivia - for those who is afraid of Lithium availability for Green Mobility revolution. 2. Lithium in Bolivia is Not for Western Green mobility revolution - for those who thinks that Bolivia will kill all other Lithium producers. 3. Watch particularly second Video. 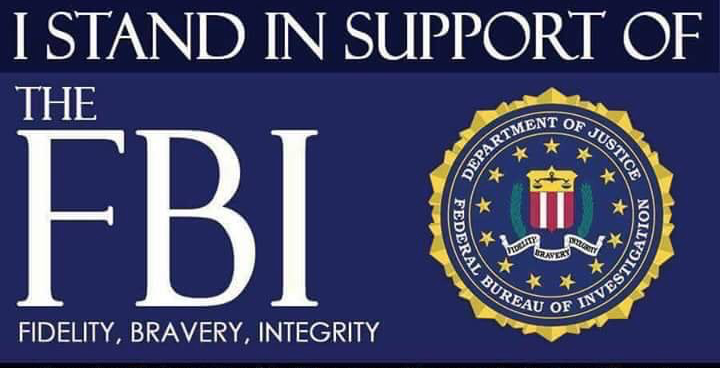 We have been there and know what we are talking about. We are out of politics, but prefer to live and write about our right to know - with even Goldman Sachs Front running and Tipping and markets far from effective (always ask for whom? ), than search for soap and live without any rights. Fears of Secured Lithium Supply from Bolivia could be exaggerated, Western world will need to develop its own resources. "Now with Electric Cars and Green Mobility Revolution at our doorsteps Lithium and REE is a strategic commodity, when every government would like to have a certainty of supply and not to trade Oil dependence for Battery dependence. It is an opportunity to restart heavily indebted western economies and move it in the new high value added 21st century manufacturing space." "As we all know, Electricity comes from the electric socket on the wall, but where from Lithium and REE comes apart from broadcasting fever and websites full of this stuff?" It looks like we do not have to preach about our Lithium and REE bull market any more and CNBC and BNN is taking the lead with THE Wall Street Journal. Apart from our English specially spiced with patented new grammar inventions and misspellings we have to give something more to stay at the edge of the green mobility revolution. As we all know Electricity comes from the electric socket on the wall, but where from Lithium and REE comes apart from broadcasting fever and websites full of this stuff? Why some companies involved are proclaiming that it will be important to have a "strategic balance of both pegmatite and brine projects - pegmatites with the advantage of presence rare metals such as tantalum and niobium, while brines offer the low-cost large scale production of lithium carbonate that will be increasingly important"? Time is to invest in understanding of our Next Big Thing. 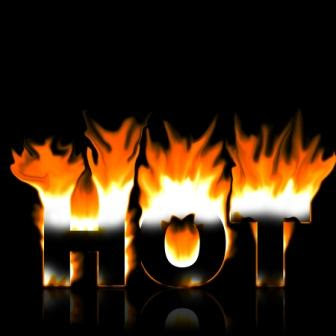 Hot commodities Lithium and REE are driving recent Junior market boom and it is time for your homework. Have a taste of what is happening in Geo rim and what to expect from companies claiming to be a part of Next Big Thing and Green Mobility Revolution on supply side - can we call Lithium the New Oil after all? "CS. We have been there - we have seen this before: in Gold, in Uranium, in Moly. Nothing is wrong with a letter writer sales pitch below: for us it is an important sign that Lithium and REE market is ready to take off. Until now almost everything with Lithium on the web page was making you money and it will continue for a while, but it is time to make your homework right: we will have a roller coaster ride and you need to know what to hold, what to add on the dips and what do not even touch. If you never even called the company you are investing in, do not bother with the whole exercise - you will be burned. Hungry brokers and investors after market collapse will rush into hot very narrow money base Lithium and REE sector with micro caps and the ride could be explosive." As always use the latest rocket science toolbox in investment studies: kick the tires, study the market players, make calls, read and go where the right people involved. Warren Buffett and John Doerr can give you first ideas, new Lithium mass media stars will give you food for thought on what they say and particularly what they do. Mass market means going down unit cost and improved safety and quality of production. Competition is hitting up between BYD and other Chinese newcomers and industry heavy weights like Toyota, Honda and Nissan. Customers will be able to chose, prices will go down and Lithium supply will define the speed of market transformation. "Our mass market for Electric cars and Green mobility Revolution is closer than a lot of people think." "Now with Electric Cars and Green Mobility Revolution at our doorsteps Lithium and REE is a strategic commodity, when every government would like to have a certainty of supply and not to trade Oil dependence for Battery dependence. It is an opportunity to restart heavily indebted western economies and move it in the new high value added 21st century manufacturing space. UK is very active in this area with few projects announced in Electric cars, battery making and Hybrid cars production. Next Big Thing - industrial revolution based on green mobility, brings potentially explosive move in Lithium and REE products pricing. Cost of Lithium in the battery is 3-5% and price could move substantially before affecting supply. Welcome to the Gold market back ten-fifteen years ago - with recent Gold price close to 1000 USD/oz Majors are mining deposits considered to be a dust with Gold price at below 300 USD/oz. Lithium price has moved already from 2000 level of 2000 USD/t of Lithium carbonate to over 6000 USD/t now with electric car fever just starting to get into mass media and economies still recovering from near death experience. "We have spoken many times this year about the 800-pound gorilla and its nearly insatiable appetite for everything resources, from uranium to copper to iron ore to oil and even solar power. China sees the forest through the trees and knows that it must stockpile a large amount of resources now to ensure it can feed its ever growing population and economy in the future." Will China now move to secure Lithium supply? Chinese battery and electric automaker BYD Co. has set up a plant to mass produce lithium batteries for its electric cars in Huizhou, south China's Guangdong Province, according to the China Securities Journal. BYD, partly owned by Warren Buffet, has injected around five billion yuan (about 731.5 million U.S. dollars) into the operation of the Huizhou plant, which produces rechargeable batteries, automobile parts and handset components, the newspaper said Thursday. Facilities for the production of batteries for the company's electric cars are almost ready now, since construction began in September last year, the newspaper said. The Shenzhen-based company's F3DM, China's first plug-in hybrid, made its debut last December. Huizhou plant, the first eligible for mass production of lithium-ion batteries that are core technologies of BYD's electric cars, is seen as a key step in the company's electric car manufacturing. The Wall Street Journal said Saturday that the company is aiming to sell its all-electric battery car in the U.S. next year, ahead of the original schedule, citing company Chairman"
XIAN, China -- BYD Co., the Chinese auto maker part-owned by Warren Buffett's company, is finalizing plans for an all-electric battery car that would be sold in the U.S. next year, ahead of the original schedule, Chairman Wang Chuanfu said. In an interview at a BYD factory here, Mr. Wang said the company aims to use money from a planned new-share sale in China to help pay for the U.S. push, as well as for a second production line for automotive lithium-ion batteries near BYD's Shenzhen headquarters. He said BYD wants to build up its brand name in the U.S. ..."
Above is the latest data on "cash for clunkers" sales: Toyota and Honda are on the top of the list. Should economy green shoots become weeds programme will be extended - it gives direct benefit to consumers in big ticket item sales which supports real economy and all manufacturing sector. These two companies define mass market and what they are doing in Electric space is very important. Our mass market for Electric cars and Green mobility Revolution is closer than a lot of people think. 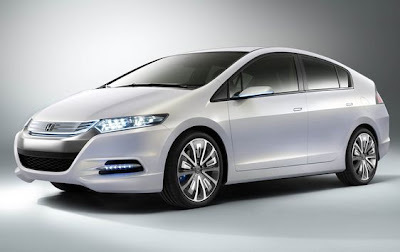 Honda's hybrid Insight was a hit and number one car in sales in Japan this spring. It is the second-biggest auto producer in Japan and its ability along with Toyota to bring the mass market for Electric cars should not be underestimated. It is not an expensive toys any more: full capacity autos with "Feel Good" attitude built-in. Electric cars economics will lead the way for market penetration. "Lithium batteries race is on and we are working with our juniors on Lithium and REE supply. Next industrial revolution not only means to address the US baby boomers demographic bust: mass exodus from working force and change of their investment and living criteria, but also geopolitical strength of ailing US Corp. Real race is between new rising power of China spiced by BRICS and US Empire - who will be able to get out of the Oil needle first and improve (China) or sustain (US Corp.) life style of its subjects? There are estimations that at oil price close to 70-80 USD/barrel around 1 Trillion dollars was paid annually for oil Import. US Corp can not afford it at prices above 100USD/barrel any more. For over the half of the century control over Oil meant control over economic development: how much China would pay for an effort to make all latest "liberation operations" by US Corp Null and Void just moving up the technological chain into Electric mobility space? We have mentioned time over time that decoupling is here already with China at Two Trillion reserve and US Corp. at Two Trillion deficit. Electric cars were killed a few times before, but this time everything is different: it is a matter of survival for USA and it is not at the mercy of its Masters an y more - China is dictating the shift and US is catching on - at the heart of the battle are macro and micro economics: employment, new manufacturing base, high tech utilisation and its military applications and 5 cents per mile against 15 cents in best case with convectional engine. We hope for the sake of "democracy survival" that this time is too much at stake to kill the idea in the "Free world" and all recent news are supporting this notion. Who will win technological race? We do not know and investing in commodities for the future and building our presence in this Bull market, where winners will the our buyers." TOKYO — Honda Motor Co. plans to introduce electric vehicles in the U.S. early next decade, joining a growing number of automakers vying for the lead in clean technology development, local media reported Saturday. Japan's second-biggest car maker, which has focused on gas-electric hybrids so far, is building an all-electric prototype to be unveiled at the Tokyo Motor Show in October, according to the Nikkei financial newspaper. It said Honda would begin sales of electric vehicles in the United States in the first half of the decade. A Honda spokesman said the Tokyo-based company has begun to develop electric vehicles, but has not decided on a release date. He declined to be named, citing company policy. 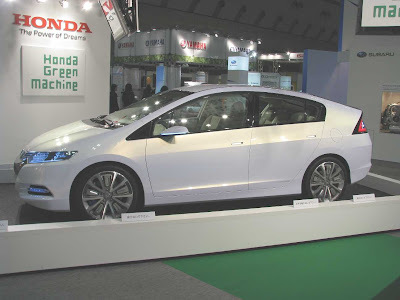 Honda released its new Insight earlier this year, billing it as the cheapest gas-electric hybrid on the market, to compete with Toyota Motor Corp.'s top-selling Prius. But with U.S. environmental regulations expected to toughen, automakers are stepping up efforts to release zero-emission cars. Honda has leased a small number of its FCX Clarity hydrogen fuel cell vehicles to customers in Southern California since last year. Their high development cost, however, prompted Honda to consider adding electric cars to its lineup, the Nikkei said. Among its rivals, Nissan Motor Co. is set to begin selling its Leaf electric hatchback in the U.S., Europe and Japan next year. 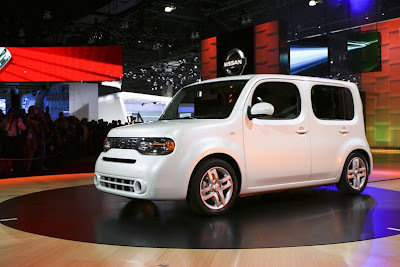 Toyota Motor Corp. has said it plans to launch electric models by 2012. 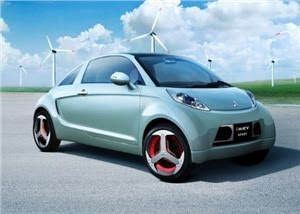 In June, Mitsubishi Motors Corp., launched its own electric vehicle, the 4.59 million yen ($48,300) i-MiEV. Ford's first battery electric vehicle, the Transit Connect commercial van, is to be available next year, while General Motors Corp. is set to release its Chevrolet Volt next year, a rechargeable electric car with a small internal combustion engine that the company says will get up to 230 miles per gallon (98 kilometers per liter) in city driving. The Obama administration in June said Ford, Nissan and Tesla Motors Inc. would be the first three beneficiaries of a $25 billion fund to develop fuel-efficient vehicles." " We still see a remote opportunity of reincarnation of Sterling Mining for its shareholders in the form of out of court arrangements with debentures issued to creditors and Minco Silver taking Sterling Mining effectively over as a subsidiary in a share exchange. By the SNS Silver price indication our take is that not a lot of people would like to be in the boat with fast guns any more." BIG CREEK — At 12:05 p.m. Wednesday, Sterling Mining Company took possession of the Sunshine Mine from Sunshine Precious Metals, Inc.Sterling Spokesman Bob Higdem said Chief U.S. Bankruptcy Judge Terry L. Myers ordered Friday, Aug. 14, for SPMI to give the Sunshine Mine property back to Sterling. There were plans to meet with SPMI representatives on the Sunshine property at noon, he continued, but no such members arrived. Sterling representatives waited a brief period before Higdem walked on the premises and obtained keys from SPMI security personnel. “That was short and sweet,” Joe Guardipee with Sterling said.Higdem then said that a team of security would be established while qualified experts in the field assessed the property to determine the condition of assets. “They’re former Sunshine workers who know what to look for,” he explained.February was the last time the mine was evaluated, Higdem continued, and one of the main concerns is how much groundwater has filled up the holes in the property.“We believe at the current rate it measures between nine and 14 inches per day,” he added. “We hope to have pumps going as soon as possible, but that will take time.” Higdem declined to estimate the value of the property and said this issue is still being debated between the property owners (SPMI) and the lease holders (Sterling). 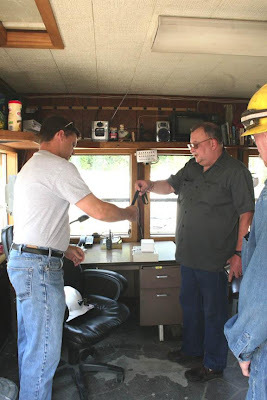 Prepping the mine for freezing temperatures will also need to be taken into consideration, he stated, and Sterling already has an 11-person team of knowledgeable personnel picked to work full time on assessing and preparing the property. “These are things that need to be examined,” Higdem said"